Christine Peters is a jeweler, designer, and fidgeter, who always has her hands busy. Lover of chocolate, books, animals, and Maine in the fall. Trained sculptor. Independent woman, daughter, sister, friend, and maker and doer of all things artsy. My amazing friends and family have once again blown me away. They've pulled together an auction full of wonderful art and craft. The sale will benefit me as I continue to recover from my breast cancer ordeal. While my major treatments have ended, it's been difficult to regain my energy to work much at all. I know it will get better, but until then I am asking for your help. Thank you. This Thanksgiving I am so thankful and grateful to all of my family, friends, collectors, supporters, and doctors who have helped me through my ordeal with breast cancer. It was the scariest thing I ever faced, and you held me up with your positive energy and kind words of encouragement. I am humbled and overcome with the love I feel from you and for you. Giving thanks means so much more this year. I will keep this love, peace and happiness moving forward into my long future. It's been a little while since I've given an update, but all is going well. I finished my radiation treatments yesterday--yay!!! While radiation has been on the easier side of my treatments, a radiation burn under my arm has made it painful and uncomfortable. Having to go everyday Monday-Friday, has been a real chore and my energy is zapped--I've been finding it difficult to get out of bed in the morning. I am sooo happy to be done! Next up is a big appointment with my oncologist on Thursday. The next phase of treatment, what kind of drugs I will take for the next 5-10 years, will be talked about and decided on, as well as my future followup. I'm ready for my energy to return and get back to working in the studio on a regular basis, as well as planning the future on all accounts. My hair is growing back and that's a sure sign of moving forward! My emotions continue to run high as I try to process the last 6 1/2 months of my life and all that has happened. Thankfully I can take it one day at a time. Thank you for all your continued love and support. I want to thank everyone who came out this weekend to say hi and support me during the show this weekend. I felt so good to be there showing and selling my jewelry. Such a nice (and exhausting) weekend of normalcy!!! I had the month of September to recover and heal from chemo and grasp the next phase of my journey. I was mapped (tattooed) for radiation and started treatment last Thursday. So far it is proving to be as suggested--a piece of cake compared to chemo! And I'm so thankful for that! I continue with this treatment every day, Monday through Friday for 5 1/2 weeks. And I only have to drive to Bath, much easier than driving to Portland everyday. Have you ever wondered what it looks like to be in the radiation treatment room? Well, here it is! I lay on my back with my arms above my head in supports. My feet are elastic banded together so I won't shift my position. They line my body up with the tattoos they've given me and then radiate my whole right breast quadrant--from center sternum to armpit to clavicle. Thankfully it's not a long process, about 10-15 minutes from start to finish. I can handle it! The people who work here are so kind, as everyone I've encountered during this adventure has been. My fatigue from chemo is slowly getting better. It still catches me off guard, but I manage. I rest when needed and give myself a break--this year has been all about healing. My taste is coming back, thank goodness. And while it's getting cold outside, I am still walking as much as possible. It's part of my sanity routine. As is working in the studio--my true joy. I've been able to create a little and enjoy every bit of it and know my daily routine will continue to get longer and stronger. It's difficult for me to grasp that summer is over and we're into fall. While September proved to be a spectacular weather month, I can't help but feel the loss of time. I'm not ready for the cold weather, loss of light, and ultimately the winter. But I'm not going there now! Every day is a blessing and a gift and I am living each one as fully and alive as I can. I hope you are too! Happy September and Goodbye to Chemo! Happy September! I am happy to report that I completed my last chemo treatment--yay!!! The fourth infusion was on August 31 and I am so happy to put it behind me. It's hit much harder this time with nausea and belly issues. I'm treating and trying to stay ahead of it all, but knowing I won't have to do this again, makes the discomfort less. It won't last for much longer. While it's hard to believe it's September, I do love this month. It's also the time for my favorite show Laudholm Nature Crafts Festival in Wells, Maine. My dear friend Kate will be doing it for/with me. If you find yourself out and about this weekend, stop on by. I'm processing and dealing with the next phase of my life. Knowing I'll be having a little more energy makes me so happy and the first place I'll be is in the studio--the joy it brings is unmeasurable. Thank you for your continued love and support. Normalcy is just around the corner! I have completed my third round of chemo and only have one more to go--YAY!!! It's difficult to believe that it's already the middle of August. The summer has flown and ultimately, is ok with me. Chemo side effects have remained the same for the most part--fatigue and loss of appetite and a little chemo cloud brain being the worst. I've been fortunate to have my some of my energy return between treatments and that has allowed me to go into the studio and do a little creating, as well as take part in a couple of trunk shows. Having normal moments means so much and being social and sharing my love with you keeps me going. Fourth and final chemo happens on August 31. I will have a little recovery time 3-5 weeks before radiation will start. I'm looking forward to giving my body a reprieve from treatments and hope it will rebound well. I want to thank you for your continued support and love during this crazy adventure. Your kind notes and visits mean the world to me. Your words carry me during all times of the day and night. Wishing you all a great August! If I can't make jewelry, I'm keeping my hands busy with all my sewing. 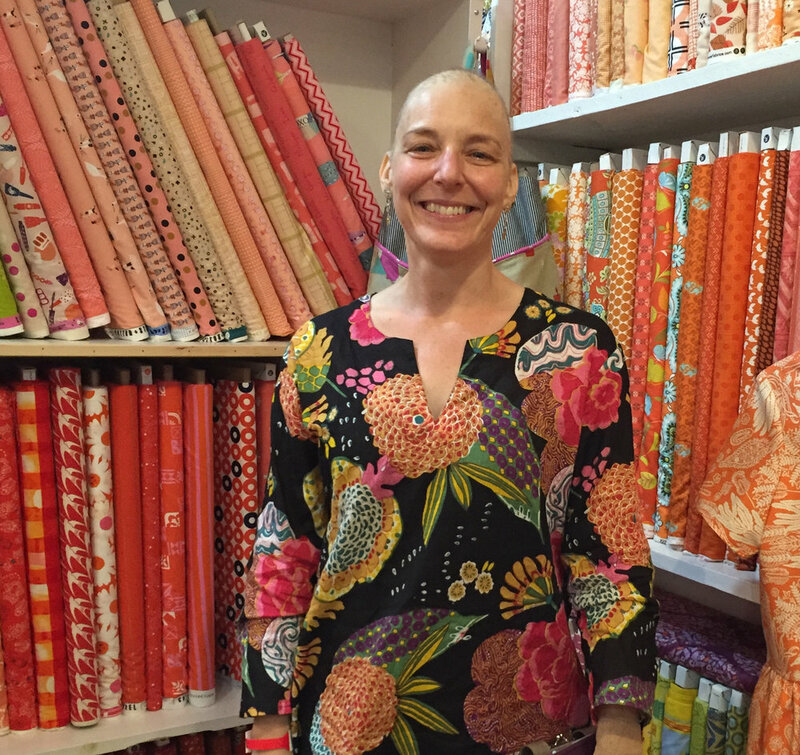 Here I am at my favorite fabric store--Alewives. I'm half way done with chemo--Yay!!! This second dose hit me about the same as the first, intense fatigue and sleep, taste issues, and itchy breakout skin. But truly all manageable. It still seems so surreal that I have cancer. Until of course I look in the mirror and recognize it's me looking back, with very little hair, but the same strength and smile shines through as before. 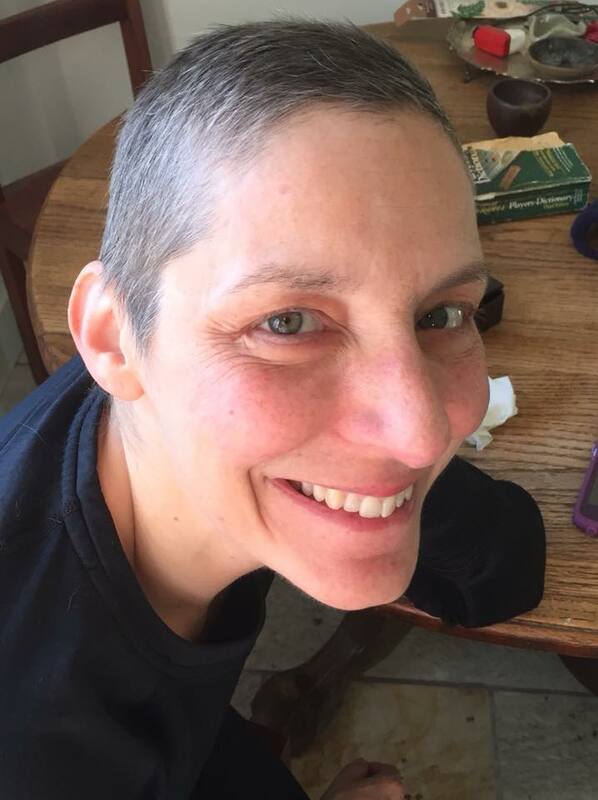 My journey and decision making continues--I had a visit with the radiation oncologist and the full picture of the next step is still coming through. It's been strongly recommended to me to have radiation treatment after chemo. And after processing the information, I have to agree that it is in my best interest to do all I can in my power to prevent future recurrence. So after my chemo infusions finish at the end of August and I recover to the end of September, I will then start a 5 1/2 week radiation treatment, 5 days a week. I am realizing that 2017 is my year of treatment and healing. I'm doing all I can to maintain the best health and positive attitude. And most of you know, I am forever positive! I continue to walk as much as I can and enjoy the beauty all around me. A little nomalcy goes a long way! My support group of family and friends and doctors holds me high and all the love and support I receive from clients buying my jewelry fills we with joy, that I can share my love and passion with you. I welcome your hellos and words of inspiration and positivity. I got the thumbs up to work as I feel well. And just sitting in my studio soaking up the energy in there makes me feel better. It will be slow, but new work will be coming, new ideas are never ending. Thank you, thank you for your continued support and love! It's been a month since my surgery and I am healing beautifully. All of my doctors are pleased and I am feeling good. I think surgery was the easist part of this journey. I see my plastic surgeon in a couple of days and am hoping to get the okay to start some new arm exercises and most especially hoping for a thumbs up to work in my studio. Fingers are crossed! It's also been nearly 2 weeks since my first chemo treatment. Have to admit it was not nice. While I am so happy to not be experiencing nausea and vomiting, I've never experienced full body fatigue like this before. Every ounce of energy I had gained during the three week post surgery, has been sucked away. The fatigue came on at pace and I never knew I could sleep all day and all night with barely an hour between waking. The midnight and four o'clock hours are probably hardest. Comfort is no longer achievable while lying on my back in bed--my body craves movement, but still I have to refrain. Healing is coming along, but time is the remedy that my body needs. Slowly I am regaining strength and energy. Three more rounds to go. The weather here in Maine has been stunning and I am so thankful to be able to sit outside and feel the warmth on my body. I am taking care, listening to my body, and living day by day. I so appreciate all the love and support I receive from you all every day! The positive energy bolsters me up and keeps me smiling and strong. Thank you!!! I am so grateful and blessed! Thank you all for your love and support! Your kind words hold me up while facing this adventure head on. I will rock this!